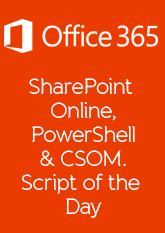 In my previous post I looked at some of the very basics of PowerShell but now its time to create some scripts. I’m always building new virtual machines on my laptop and I’m fed up having to add IP Address and how I have click so many times to add this and type in a new computer name. 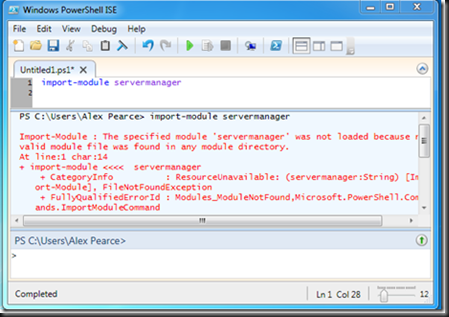 So thought PowerShell can solve this problem for me. The first issue I had was that there are some security issues to stop you from just running scripts that change computer settings like this. First run the command before to change the execution policy on your computer. You then have to confirm that you want to do this. Firstly I want the script to prompt me what computer name I want and then the different IP settings for the server. I type in $NewName=Read-Host “Computer Name”. If we break this down a little you’ll see the different settings you’ll need for your script. The $NewName is your variable to store what you have typed. Later in your script where you type $NewName it will be replaced with what you type when you were prompted. Where you can see “Computer Name” is the text that will show up on screen as the descriptions of your prompt. Here on the 3rd line you can see it has displayed what we typed when prompted. To actually change the computer name we need to run 2 lines of PowerShell in our script. Have a look at the code below and you will notice on the second line it has $newname which is from the prompt earlier. When adding this to what we already have we the script will change the computer name to what we were prompted. The computer will then change name after a restart. A new command line tool that I have started to use in recent weeks since I started looking at Window Server 2008 Core is netsh.exe. Netsh allows you to control the behaviour of the networking on your windows device. I change change the IP Address, change the name from Local Area Connection to what ever you want it to be. I can also change the firewall settings as well. We’re going to add a few more prompts for the IP Address, Subnet Mask, Default Gateway and DNS Server and these will be used during the netsh commands. All together we have 3 netsh commands in this script, one will set the IP, Subnet and Default Gateway, one will set the DNS Server and other will turn the firewall off (in my development areas I turn my firewall off). Below is the full script to change the computer and it will have ask for prompts and add the right information into the script. 5: $addres=Read-Host "Please state the IP Address"
I’ve been meaning to learn PowerShell for some time now as its an important of SharePoint 2010 and I thought I better get started. In SharePoint 2010 even if you wanted to try and avoid PowerShell you won’t be able to as this is the best way to patch your farm. Over the years I have created several batch scripts from collecting computer programs and services installed on all machines on a network, creating all my default Active Directory accounts and a user creation script that adds user to the correct Organisation Unit and AD Group which then allows the user to access the correct sites within SharePoint. I love these scripts and I love batch files as they have always done what I wanted them to do at the time. But PowerShell is here now and its a new learning curve and I need to learn it. I’ve played around with it a little before when I’ve mailbox enabled an Active Directory username and it has returned the PowerShell command but that’s cheating as it has already given me the code. I’m not going to learn it by copying and pasting, I need to work out how to do things and get error messages, do some research and then get the results I want. Windows PowerShell is an extensible automation engine from Microsoft, consisting of a command-line shell and associated scripting language (Source: Wikipedia). It now comes standard with Windows Server 2008 R2 and Windows 7. There are some built in command that manage the operating system but there are also modules you can add to add command and script against that product. In Windows 7 you also get Windows PowerShell ISE which stands for Integrated Scripting Environment which is a great way to write scripts and see what is going on with errors. You can run it in this environment to test the script. As you can see in the middle section of this screenshot when I tried to import the servermanager console returned an error mainly because the module can not be found on this machine. There are some command line commands that still work in PowerShell, like changing directory is still cd %foldername% or to create a new folder is still md *newnameoffolder*. To me, I prefer the older version – its quicker and I already know this and when it comes to creating a script I still use the older commands. If you think you are going to have to learn everything in powershell, don’t worry there are some old commands that still work ;-). 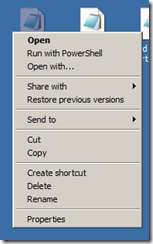 The old style batch command were easy to create and they are the same in PowerShell. Instead of using the .bat extension you have a new one called .ps1. Microsoft have really helped with editing the file. 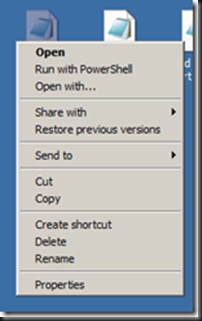 If you want to edit the file double click on the file and it will open up in notepad and if you want to run the command you right click on the object and then click Run with PowerShell. The number of times I’ve gone to edit my batch script and I’ve run it by mistake is not worth counting. Now I can’t make this mistake again. I had to do some research for the next part. I’m in my PowerShell console and I can’t load my .ps1 script. I type in the file name and it just doesn’t run. 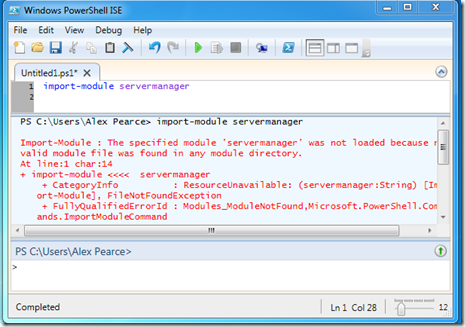 To run your powershell command type in .file.ps1 and it will run it for you. I’ll keep you updated on how the learning is going. 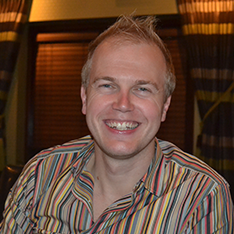 My objective is to install Active Directory, SQL, Exchange and SharePoint all through PowerShell.